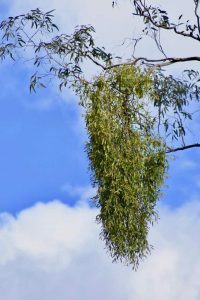 Mistletoe occurs all over the world and in Australia’s native forests we have numerous species in all states except Tasmania. Mistletoe is a hemi-parasitic plant that relies on its host for water and minerals, but has chlorophyll and creates its own carbohydrates and sugars. Although it lives off its host, it is harmful only if the infestation is severe. Eucalypts and acacias are the most common host plants. Mistletoe provides shelter and food for many animals. The flowers of Amyema miquelii or Box mistletoe, the most widespread mistletoe, are attractive, tubular and red and are followed by fleshy yellow fruit. Birds are responsible for most of the seed dispersal. The Mistletoebird and Painted Honeyeater seek out mistletoe, but many birds eat the fruit and spread the seeds. The seed is sticky and, of the many excreted, some will attach to a branch. A tendril emerges from the seed and secretes enzymes that weaken the outer layer of the branch, allowing the tendril to penetrate and reach the nutrients it needs. Plant of the month is Leptospermum polygalifolium (Wild may), an ornamental compact shrub to four metres with aromatic leaves and white blossoms in spring.